MUFF WIGGLER :: View topic - Favorite VST Delay to patch as Resonator ? Favorite VST Delay to patch as Resonator ? Do you use "VST" delays as DIY resonators ? most delays, hardware as software are setup very conservative in regards to their accesible time-range in the "fast setting area". The 1-5ms area +-. Software seems even more restricted than hardware. some pretailored Resonators like the one in Live are not doing it for me respectivly do i anyway totally love to DIY my own resonators with Delays. the results are just different and often more musical. Donne it mostly in the hardware world i totally struggle now to find a VST Delay that is doing it well enough. Unfiltereds Sandman pro would be perfect with its feeback path setup inclouding filters ( Hishelf and loshelf) , but the time range is not tailored to do that task well enough. Echoboy allows for relatively fine adjustment down to 0 ms and sounds decent in this application, even though the feedback goes from nice to nasty fairly quickly. There are some options for altering the feedback path, including (non-resonant) filters and diffusion. You can definitely get some nice results, and with all the settings available in the Tweak and Style Edit sections there is some room for experimentation. The Modern algorithm in Replika XT sounds really good at low delay time and high feedback settings. However, the resolution of the delay time control is limited (use shift for fine adjustments), so it can be hard to dial in specific pitches. On the other hand, the additional effects can be routed in the feedback path, which is great for experimenting. One of the effects is a (resonant multi-) filter that sounds exceptional, even if things get crazy with a lot of feedback plus resonance. Also try the Diffusion algorithm, it can be used as a very complex resonator. In Sparse mode and at low Size settings it excels at cymbal-like sounds, and you can automate from resonating textures to full-blown reverb easily. Speaking of reverbs, they can also be interesting resonators. Ones that are based on FDNs are particularly useful – you will love AriesVerb, for example. I only discovered it recently and really like it for experimental purposes. The Ircam Verb would be another example, it's more polished than AriesVerb and sounds better as a reverb, but is not as open-ended in terms of control. I'd also recommend to look at flangers (and similar), which are essentially comb filters / resonators with modulation built in. They are more tuned to this kind of application. On the downside, they often only offer delay times up to 10ms, so you cannot tune in low registers. There are exceptions though, including the ones below. I've been using Flair from NI's Mod Pack a lot recently, which stacks multiple comb filters and even allows you to tune them in chords. There is also Scan mode, which blends through the comb filters one after the other (as if you were feeding the individual comb filters through a Haible Interpolating Scanner or Toppobrillo Mixiplexer). Valhalla's ÜberMod is another great option when it comes to experimenting with this. It offers very fine adjustment of the delay time, and the feedback is super well-behaved (but can be taken further with the Drive feature). I have not found a way to have less than two delay taps, however multi-tap resonating is also fun. The delays time control has some slew on it, but this also gives a nice flavor. Add diffusion, modulation, stereo options – a lot to explore. You could have a look at HY-Delay 3. Its minimal delay time is 30ms when in short mode but you can reduce it to 5 ms with the offset/fine setting. Looks nice, though 5 ms minimum delay time limits the range to 200 Hz and below. I would not call it a VST delay, but Native Instruments Prism is my go-to resonator in software. Ok, this is much info. And still not used Prism in FX mode. yeah, the 5ms as shortest is not what i´m interested in as this is commonly available allready. i try to emulate what i do with modules/Hardware. things begin to become interesting when jammed by hand.....or sequenzing i hope. ranges down to 0.001 ms are useful ! see Clavia G2. some resonators begin to live when wiggled. they breath . Much Thanks listenofaheartbeat ! and everybody else ! Ariesverb goes down to 1 microsecond. Don't forget Absynth, which can be used as a VST effect as well as a synth! Ariesverb looks very interesting ! need to give that demo a go. stumbled then over that NI FX block thing, .......ahh, molekular or so, and misunderstood the routing sheme. MUX from Mutools has a resonator module. The module resonates the incoming audio. Besides the pitch parameter it also responds to incoming note events and so the resonation frequency can be played by a keyboard or sequence. Channel Mode and Key Follow are self-explanatory properties. Reset Mode defines when the Resonator should reset any past resonations and restart with a clean sheet. Invert FB = Invert Feedback = defines whether resonations are inverted in amplitude each time they bounce the wall. You need to go to the ROUTING options and select one with parallel processing. For delay processing with another effect in the feedback loop, select a delay / comb filter for one of the first slots, and another effect for one of the parallel slots. Then tap the feedback from behind the parallel slot, and send it back to the beginning of the chain. To listen to to the output of the delay / comb filter, enable the SCAN option (essentially a crossfader for the output, blending between the two parallel slots) and set it to the empty parallel slot (which carries the direkt signal from the first slots, i.e. the delay / comb filter in this case. I find this thread a bit weird as Ableton not only has 2 resonator devices (Resonators and Corpus) and multiple M4L options for both delays and resonators, but also all the four native delay devices (Grain Delay, Simple Delay, Ping Pong Delay and Filter Delay) go down to 1 ms and can be tweaked to 2 decimals (like "1.36 ms"). Anyhow, seems it may be the knob range that bothers you in both the Live devices and Replica XT? One thing you can do is MIDI map or macro the time knob in those, and then restrict the Min/Max range (mostly the Max in your case) to lower ms values in the Mapping Browser. My dear Funky40, you need to explore the tools you buy a little bit more! First UberMod, now this! as i mostoften just sit down and want to make music vs. dealing with manuals, new gear or new VSTs etc. dealt some time with it, got bored, i use pianoteq again standalone. i have way more unused VSTs then just these two btw. and those few i use and explore take LOTS of time to dive into and to explore their musicality in a musical context. its a process over years and finally a world that is in my eyes bigger than learning to play piano or to study composition for example. Thanks listenofaheartbeat, this is very great input. guess thats my way, the onboard live devices i tryed were not to my liking, so i ended up not looking further there. i used Lives resonator FX btw. its part of some patches. Just not used the delays. 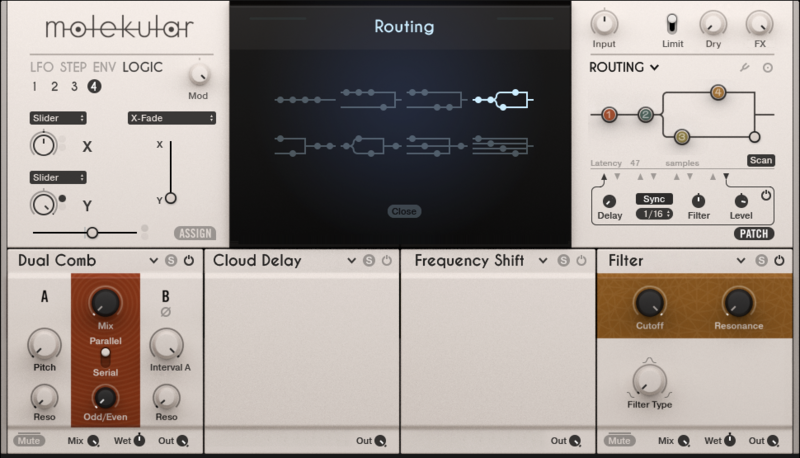 You can freely route a feedback (or feed-forward) connection with some additional processing (delay, filter) in the additional routing section on the right side. Maybe it's worth noting that digital filters are based on delays, too. now thats very interesting. Sounds Good ! The Aries delay is *exactly* what i was looking for ! wiggling with the Aries demo , so no controller mapping right now. the norris Chorus is indeed resonating great and nicely glitchy when modulated. Hey @Listen, thanks so much for this detailed guidance! Molekular is so complex I just couldn't figure out how to do this. Many thanks. "Orbiter 4MXL has a unique sound concept, based on a Noise Generator that is running through a fixed Filterbank and 4 parallel Filters."